With CindyScript you can produce controlled and styled text for a drawing. The essential functionality is covered by the drawtext operator. 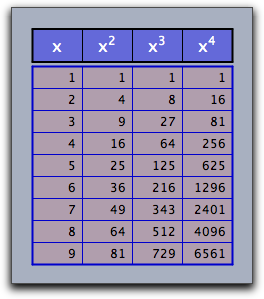 Furthermore, with drawtable a table output can be generated. Using texts and tables in scripts is very useful, since one can use the script language to control when and where text is displayed in a construction. This is a very important tool for providing explanatory texts and functional exercises that react to input. Description: The drawtext(<vec>,<string>) operator plots a text <string> at a specified position that is given by the position vector <vec>. This position vector can be given either in Euclidean xy-coordinates or in homogeneous coordinates. Example: The line drawtext((0,0),"Hello World") prints the string "Hello World" with lower left corner at the position (0, 0). Modifiers: The drawtext operator supports several operators for the modification of appearance and position. and monospaced are allowed, that always produce corresponding standard font types. If the string expression contains a <newline> chacracter then this line-break is literally interpreted. By this it is easy to produce multilined text, as the following piece of code shows. are really used as line terminators. Description: This operator produces a list of all font families that are available on your computer. Usually this will be quite a lot. The following piece of code displays the names of some of these font families in their own font style. Description: Cinderella can display any Unicode Character in text strings. To access a unicode character the statement unicode(<string>) accepts a unicode description (a number) given as a string of digits. It returns a string with the corresponding unicode character. By default the base of the unicode description is 16. So hexadecimal descriptions are usually accepted as input. The base can be changed by a modifier. The base of the unicode description can be changed with the base modifier. Example: Both unicode("0041") and unicode("65",base->10) produce the character "A". Description: This operator tests, whether a given string can be displayed in the currently chosen font. It returns a boolean value. 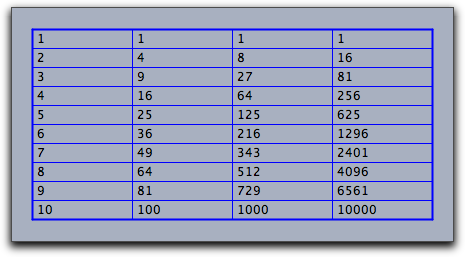 One- and two-dimensional lists can be easily drawn in a geometric view as tables. In the simplest form one has only to provide the list and a position where the table should be drawn. Modifiers can be used to fine tune the appearance of the table. Example: The following code is a more elaborate example using the drawtable operator. modifiers are used to create a nice appearance of the tables. A second table is used to create a heading for the table. Contributors to this page: Wurster , Kortenkamp and Akira Iritani . Page last modified on Thursday 10 of July, 2014 [08:12:09 UTC] by Wurster.